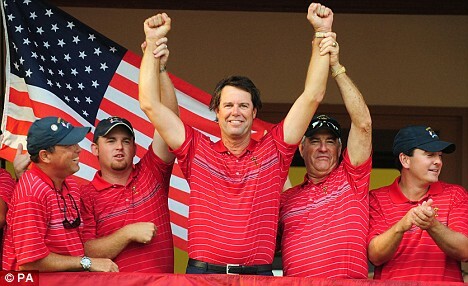 Captain Paul Azinger flanked by victorious Team USA members Boo Weekley, J.B. Holmes, Assistant Captain Dave Stockton and Ben Curtis at Valhalla Golf Club during the 2008 Ryder Cup. Up to the Challenge focuses on improvements to and a new identity for the modern eighteen holes of golf that complement and balance the restored classic, The Ross Course at Bobby Jones Golf Club, to provide greater appeal to the contemporary player and fan and to compete with the best. Unite and rebrand The Azinger Course at Bobby Jones Golf Club, with improvements and renovations endorsed by Major Champion and Winning Ryder Cup Captain Paul Azinger. Provide and market new Zinger Tees, to add competitive length and strategic options to each course and to compete within a higher and wider spectrum of the marketplace. Focus on Team Building, Team Instruction and Team Play at the Learning Center, drawing upon Paul Azinger's 2008 Ryder Cup captaincy and as detailed in the Paul Azinger book, Cracking the Code. The Azinger Course at Bobby Jones Golf Club celebrates each of Paul Azinger's eighteen professional wins, from tee to green. The CARD below shows proposed new Hole NAME and Sponsor, with yardage for current Back Tees and proposed new ZINGER TEES. Within the Paul Azinger Initiative, in addition to the primary objective of the restoration of the historic Ross Design Intent, is the intent to provide "Zinger Tees" to select Ross holes as appropriate. Zinger Tees, as strategically placed by Paul Azinger, seek to add modern competitive length to the Azinger Course, in order to attract the full spectrum of golfing participants as well as to present The Azinger Course at Bobby Jones Golf Club for consideration as a host site for top regional competitive tournaments and events. Within and integral to the Paul Azinger Initiative is the intent to provide enhanced opportunities for participation and accessibility in golf by players of all abilities and disabilities, including access to all areas of play, and in partnership with organizations dedicated to accessibility for the disabled and in particular, working with the Friends of Bobby Jones Golf Club Veterans Committee, for disabled American veterans of military service.